New Game Plus coming to Assassin's Creed Odyssey later this month | Share It Us! Ubisoft has confirmed Assassin's Creed Odyssey's New Game Plus mode will release later this month. The tweet doesn't give very much away - in fact, Ubi had to explicitly confirm that it was indeed pertaining to Odyssey a little later in the thread, so confused were commenters - so right now we can only guess what the mode might encompass. We won't have to wait long for an update, though; Ubisoft promises to share more information about the New Game Plus content later this week. 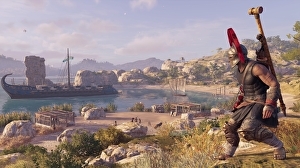 Ubisoft recently confirmed it will alter its recent Assassin's Creed Odyssey DLC, in which the publisher previously admitted having bungled a pivotal narrative choice.